The early 1990s was a transitional period in Flyers history. In 1991-92, the team was in the midst of a five-season stretch that marked the dismantling of the Mike Keenan-era Stanley Cup finalist teams and the trades that brought Rod Brind’Amour, Mark Recchi and eventually Eric Lindros to Philadelphia. These were not happy times in Philadelphia hockey – for the Flyers, happiness is measured in wins. But there were some rays of hope. The acquisition of feisty 28-year-old right winger Kevin Dineen from the Hartford Whalers in November of 1991 helped restore some of the hustle, grit and never-say-die attitude that had always been central to the team’s identity. 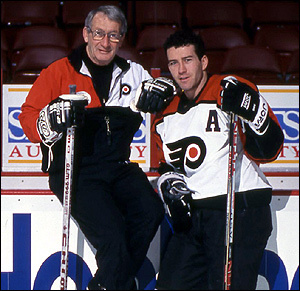 A few weeks after the player came to Philadelphia, he was joined by his 59-year-old father, Bill Dineen, who accepted the Flyers’ head coaching position after the club got off to an 8-14-2 start. Despite the continued upheaval of the roster, the elder Dineen got his young, outgunned team to overachieve, posting a winning record over the remaining 56 games of the season. At a time when the Flyers were in need of something to lift their spirits, Dineen was the right man for the job. Meanwhile, the younger Dineen brought some much-needed goal scoring to a lineup that only had three players score 20 or more goals that season. In 64 games that season for the Flyers, Dineen ranked second on the club with 26 goals (including five on the power play and three shorthanders) and 56 points. “We lost a quality hockey player in Murray Craven when the Flyers traded him to get Kevin from Hartford, but I think the team really needed what Kevin brought with him,” said Howe. “We were in a bad situation where there were some players who wanted out and some who were content with losing or making excuses. It wasn’t fun. By the time Bill Dineen made his NHL coaching debut on December 5, 1991 – a 6-3 loss at the Spectrum to the Washington Capitals – he had been in the hockey business for nearly 40 years as a player, coach and scout. As a player, Dineen broke into the NHL with the Detroit Red Wings in 1953-54, playing in 70 games as a rookie, scoring 17 goals and eight assists for 25 points. Nicknamed “the Fox” for the way he slyly got outsiders to underestimate him, the well-liked Dineen was a hard-working sparkplug on the ice and a fun-loving guy who snuck in past curfew a time or two off the ice. After four-and-a-half years with Detroit, including a pair of Stanley Cup championships, Dineen was traded to the Chicago Blackhawks in the middle of the 1957-58 season. Dineen finished the season with the Hawks, but struggled for points. After the campaign, he was informed that he no longer fit into Chicago’s plans. At the age of 27, Dineen decided to continue his career, even if it meant playing in the minor leagues. That’s where he remained for the rest of his active career, finally retiring at age 38 after spending part of the 1970-71 season and all of the 1971-72 campaign as a player-coach of the Denver Spurs (WHA). During his playing days, Dineen was particularly close with the legendary Gordie Howe. Like Mr. Hockey and his wife Colleen, Bill and Pat Dineen never pressured their children to play the sport. Bill simply passed along the joy of the game to sons Shawn (born 1958), Peter (1960), Gordie (1962), Kevin (1963) and Jerry (1966). Every one of the Dineen boys played pro hockey with Peter, Gordie and Kevin making it to the NHL. Kevin Dineen was born in Quebec City on October 23, 1963. At the time, his dad was playing in the AHL for the Quebec Aces. But like many hockey families, the Dineens moved around as Bill’s career dictated. Kevin spent the majority of his early childhood in Seattle, while his father was with the Seattle Totems, but later lived in Denver, Houston and other locales. In 1972, Bill Dineen accepted the head coaching job with the WHA’s Houston Aeros. The next year, he was reunited with old friend Gordie Howe, who came out of retirement to play alongside sons Mark and Marty. The club went on to win consecutive WHA championships and was runner-up the next year. Dineen later moved on to the New England (later Hartford) Whalers, where he once again coached the Howes. During these years, the Dineen boys were frequently around the teams’ locker rooms. In the words of Bill Dineen, Gordie Howe was like a favored uncle to all of his sons but “took a special shine” to Kevin in particular. Kevin Dineen played both forward and defense early in his youth hockey career before settling in at wing. In addition to his goal scoring prowess, he had a Tasmanian devil quality to his game. Kevin absolutely hated to lose and wouldn’t back down from even the toughest of foes. “Kevin wasn’t just a goal-scorer for his teams. He was a tone-setter,” said Dave Tippett, who played against Dineen in the WCHA and with him in the NHL in both Hartford and Philadelphia. Coincidentally, two of the Dineen boys were chosen in the NHL draft with picks belonging to the Flyers. 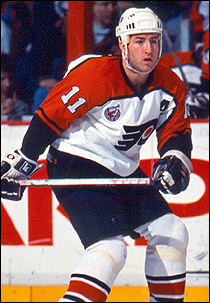 The Flyers drafted Peter, a defenseman, in the ninth round of the 1980 draft. Although he kicked around the Philadelphia farm teams for several years, he never suited up for the Flyers. He eventually had brief stints with the Los Angeles Kings and Detroit Red Wings. Kevin, meanwhile, was selected by Hartford in the 3rd round (56th overall) in the 1982 draft with a pick originally sent from the Flyers to the Whalers in the multi-player and draft-pick swap in July 1981 that sent Rick MacLeish to Hartford. In that deal, the Flyers received Ray Allison, the1982 first-round pick used to select Ron Sutter and the third-round pick used for veteran Czech defenseman Miroslav “Cookie” Dvorak. Kevin enjoyed a solid two-year college career at the University of Denver, where he majored in business management. During his freshman year, he scored 10 goals and 20 points in 26 games. The next season, he posted 16 goals and 29 points in 36 since games while setting a team record for penalty minutes in a season with 105 penalty minutes. In 1983-84, Kevin was invited to try out for Team Canada during the pre-Olympic tour. Playing both forward and defense, he won a spot on the 1984 Olympic roster in Sarajevo, Yugoslavia. With countries like the USSR and Czechoslovakia using their top professional players, the amateur players on Team Canada didn’t stand much of a chance at a medal. The Canadian squad won four of five games in the preliminary round (the one blemish was a 4-0 loss to Czechoslovakia) but were overmatched in the medal round, getting shut out 4-0 by the gold-medalist Soviets, 2-0 by Sweden and 4-0 again by the Czechoslovaks. Kevin turned pro after his year with the Canadian national team. Meanwhile, Bill Dineen had gotten back into coaching after a four-year absence. He took on the head coaching job for the AHL’s Adirondack Red Wings in 1983-84, where he remained for six seasons. Under Bill Dineen’s patient tutelage, Adirondack won two Calder Cup championships before he stepped down in 1989 in favor of the much younger Barry Melrose. During his tenure, the Fox also gained the nickname Lt. Columbo, in honor of the television detective who feigned ineptitude but was supremely skilled in his chosen profession. While his father was winning championships as a coach in the American League, Kevin Dineen was steadily making a name for himself in the NHL. As a rookie in 1984-85, he scored a very respectable 25 goals and 41 points in 57 games, to go along with 120 penalty minutes. Over the next four seasons, he never scored fewer than 25 goals, cracking the 40-goal barrier twice (with a high of 45 in 1988-89). In 1987, Dineen was part of the victorious Team Canada squad that defeated the Soviet Union in what is considered the finest Canada Cup series played in the tournament’s history. During the late 1980s, virtually every NHL team asked Hartford whether Dineen was available in trade. The answer was always a flat no. That changed after the 1990-91 season. In 1987, Dineen was diagnosed with Crohn’s Disease, a painful and incurable digestive disorder. In December of 1990, a severe flare up of the condition caused Dineen to miss several games and ultimately resulted in him being hospitalized on January 2, 1991. Over an eight-day span, Dineen lost 10 pounds. Dineen returned to the Whalers lineup on January 23, 1991. Although he refused to use his condition as an excuse for sub par play, the player was still not fully recuperated. He finished the season with just 17 goals, 47 points and 104 penalty minutes in 62 games. Hartford management publicly expressed support for Dineen but was privately worried whether the soon-to-be 28-year-old would be able to recover his previous form. When Dineen got off to a slow start in the 1991-92 season (four goals, six points in 16 games), the club listened to several trade offers from other clubs. Flyers general manager Russ Farwell was looking to shake up the roster. The team had missed the playoffs the previous two seasons and stumbled out of the gates in October and November of the current season. On November 13, 1991, Philadelphia and Hartford struck a deal. The Flyers sent veteran Murray Craven and a 1992 fourth-round draft choice (Kevin Smyth) to the Whalers in exchange for Dineen. The next night, Dineen was placed on right wing on the line centered by first-year Flyer Rod Brind’Amour. Dineen scored his first goal as a Flyer in the closing seconds of regulation to seal a 3-1 win over the Edmonton Oilers. Two nights later, the Flyers downed Montreal, 3-1. Unfortunately, the wins proved to be the final ones of Paul Holmgren’s three-plus season tenure as head coach. The club went on to lose six of its next seven games with one tie. Farwell sought the counsel of Bill Dineen, who had been hired by the club as an amateur scout. The GM asked the elder Dineen, who had been scouting a Western Hockey League league game, to fly out to New York to see the Flyers take play the Rangers on December 2. After the game – a 4-2 loss – Farwell and Dineen sat together in the lobby of the Paramount Hotel. As recounted in Full Spectrum, Farwell told Dineen he was seriously contemplating a coaching change. He asked Dineen to suggest some candidates, and was told that Flyers assistant coaches Ken Hitchcock and Craig Hartsburg had promising futures in Dineen’s estimation. The GM replied that he didn’t think either assistant was ready yet. Dineen then suggested Hershey Bears coach Mike Eaves or Adirondack’s Barry Melrose. Again, Farwell said no. Several minutes later, he asked Dineen if he’d consider coaching the Flyers. But Dineen quickly realized that Farwell was serious. The general manager asked him to sleep on it. Dineen flew home the next morning and kept quiet, not even telling his wife about the conversation. After receiving a phone call from Farwell the next evening, confirming the coaching offer, he headed down to the basement of his house and retrieved his skates. He asked his wife, Pat, if she thought the skates were too rusty to be used or could still be rescued. The hockey wife and mother immediately knew something was up. “Don’t tell me,” she said to her husband. “Billy who?” Kevin asked, shocked to learn that the Billy in question was his father. The elder Dineen viewed these actions as a means of protecting his son from feeling awkward on the team. But he needn’t have worried. Kevin had quickly become one of the most respected players in the locker room and a fan favorite at the Spectrum. Apart from linemate Brind’Amour, who was the Flyers’ lone representative at the 1992 NHL All-Star Game at the Spectrum, the play of Dineen was one of the few bright spots on a Flyers club that staggered through the first half of the season. In the second half of the season, Bill Dineen put former Montreal Canadiens left winger Mark Pederson on the left wing of Brind’Amour’s line with Dineen. The trio clicked. Pederson, whose NHL career was largely a disappointment after being a highly touted prospect in junior hockey, scored 12 goals and 35 points over the final 44 games of the season, while Dineen finished a strong rebound year with 30 goals and 62 points in 78 games and Brind’Amour scored 33 goals and 77 points. In the spring the Flyers made a major trade, sending disgruntled captain Rick Tocchet, defenseman Kjell Samuelsson and goaltender Ken Wregget to the Pittsburgh Penguins in exchange for burgeoning star right wing Mark Recchi, defenseman Brian Benning and a 1993 first round draft pick. After getting buried early in the season, Flyers didn’t have much to play for except pride. But Bill Dineen’s positive messages got the players to believe in themselves. From January 28 until the end of the season, the Flyers went 19-14-1. Many of the club’s best performances came against the top clubs in the league, including victories over first-place clubs Montreal, Detroit and the New York Rangers. The Flyers’ one tie was an exciting 3-3 deadlock with the eventual Stanley Cup champion Penguins in a game where Kevin Dineen and Rod Brind’Amour spurred comebacks from deficits of 2-1 and 3-2. In total, Bill Dineen coaxed his club to a winning record over the 56 games he coached during the 1991-92 season. He had to deal with frequent injuries, major roster changes, lack of scoring depth and frequent defensive problems, and yet a cohesive team emerged. “If you can’t play for someone like Bill Dineen, I don’t know if there’s any coach you can play for. As for Kevin, I only played the one year together with him on the Flyers before I left and signed with Detroit, but he was a tremendous teammate and a quality person,” said Mark Howe. In his Columbo-like way, Bill Dineen slyly breathed life and confidence back into a struggling team that had been given up for dead. 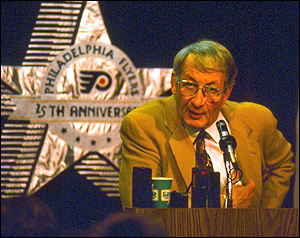 While it wouldn’t be until 1995 that the Flyers would re-emerge as a Stanley Cup contender, the coach got his teams to play to the best of their ability. In his second and final year as coach, the still-undermanned Dineen-led Flyers club might have snuck into the playoffs if rookie phenom Eric Lindros had not missed 23 games due to injury. As it was, the club only missed out by four points. In addition to Lindros’ 41 goals and 75 points, Recchi set a club single-season record with 123 points. On the second line, Brind’Amour produced 37 goals and 86 points. Pugnacious as ever, Kevin Dineen tallied 35 goals, 63 points and a career-high 201 penalty minutes.